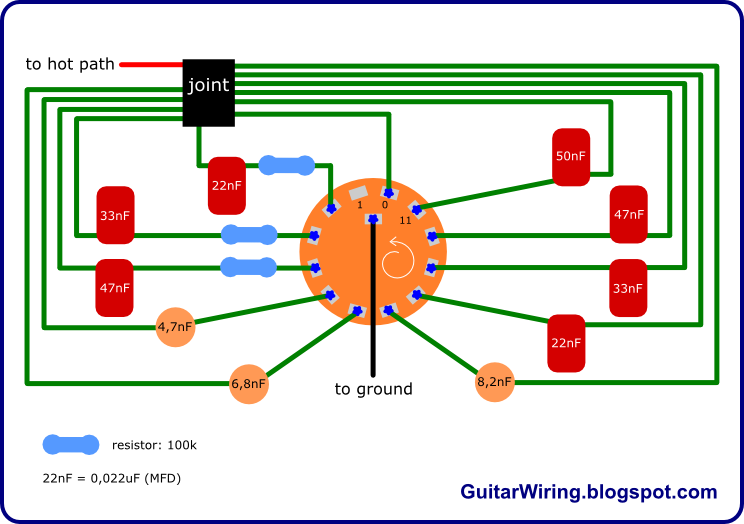 This time, my 12-position guitar varitone project is a little bit more complicated. It's still a quite simple circuit, but with a few new configurations. I added a stand-by position – as „0” - and I tuned the filters more for nice „woman tones”. I prefer this version for rock crunch and overdrive/distortion tones. The previous varitone works great for me on clean and bluesy crunch guitar sounds. The position „0” is quite interesting. There's no any cap or resistor. It means, that this thing will work like a stand-by/kill position. It will cut off the signal completely. The position „1” is the bypass. On this tune, the varitone will not affect your guitar tone. The next three positions will make your tone nicely smoother and warmer. It will be still quite well balanced - the guitar will not lose all treble. All positions with orange disc caps (ceramic) are great for making the overdrive/distortion tone fatter. They will cut-off some portions of high-end, but not too much, so the guitar will still have some „punch”. The last four caps are great for famous „woman tone”, in a few variations. The higher the value, the darker and smoother the sound. All resistors got 100K. Red caps are film types, orange caps are ceramic types. There is no choke – the switch is based on combinations of low-pass filters. 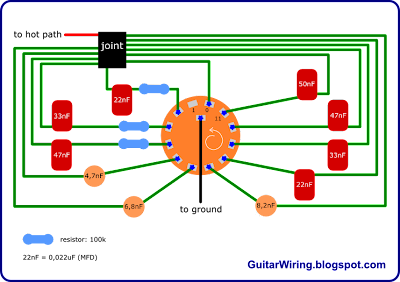 The varitone can be installed in an electric guitar in a few ways. Check out this article for more info: How to Install a Varitone.